Next year Triumph will take over from Honda as engine supplier for Moto2, MotoGP’s feeder class. 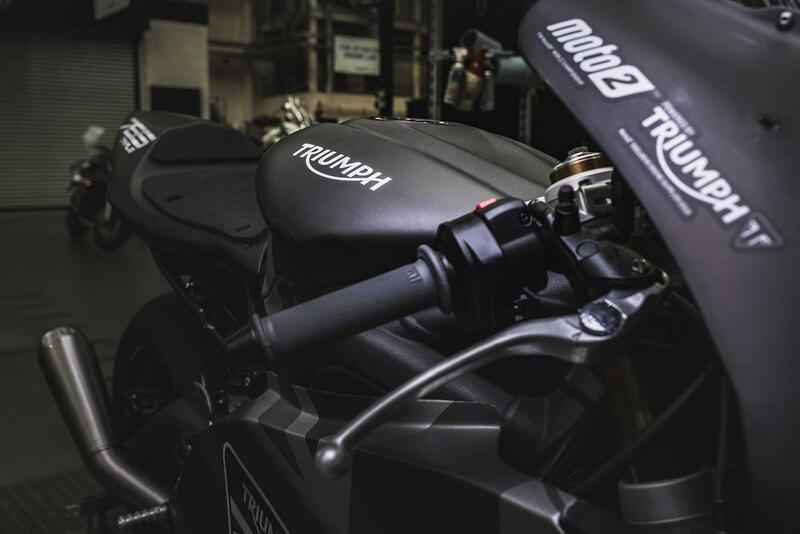 The UK firm are using a motor based on their Street Triple 765 powerplant, which has been tested over the last year in a highly-modified Daytona 765 chassis. "Snarling, booming and with lightning responses, Triumph’s Moto2 test bike gives electrifying performance. In a super-light Daytona-based chassis, but with huge power. The acceleration is stunning, but it is the flexibility that impresses most. "Around Silverstone’s nadgery Stowe circuit it allows you to pick between gears and drive out of corners at low rpm. This is combined with beautiful fuelling. Each incremental turn of the throttle is met with direct and proportional response. The engine is thrilling, yet perfectly manageable. Triumph should put it into a production sportsbike." So, what's the secret behind the engine? We spoke to Steve Sargent, Triumph’s Chief Product Officer, about its development to find out. "We needed to get more power and more torque and this was done by increasing the revs and reducing inertia. A standard 765 makes about 123bhp and we’re pushing this to 135bhp and about 59ftlb. "A lot of this comes from the cylinder head. We’ve worked with the ports to increase gas flow and put in lighter titanium valves and race valve springs to reduce flutter at high rpm. "The other way to reduce inertia is to do some simple things like removing the starter motor and the starter gears. It also has a race-kit alternator as the race bike has much less demand for electrical power and a lighter, fully-adjustable slipper clutch. "We’ve also changed the gear-box ratios. The first and second that you use on a road bike aren’t appropriate for racing; they’re both taller now and bring the rest of the ratios closer together. "We’ve got a different sump so that the headers can pass through on the other side." Moto2 convention is that the exhausts exit on the left-hand side of the bike for two reasons; firstly more ground clearance on predominantly right-hand circuits, and less damage if a bike crashes on those right-handers. "Another new casting is the right-hand crankcase and clutch cover. This has a separate cover for the clutch, allowing teams easier access. We wanted the slipper clutch to be tunable and this allows the teams to get in there easily. "We’re running standard rods, standard cams, standard pistons and a standard crank. All of these parts are good enough for the higher sustained rpm and mean that the engine is affordable. "The motors will be built and maintained by ExternPro. They are the company that build all the Honda Moto2 motors. We will ship them a kit of parts for each engine, they build it up, dyno test it and hand it to the teams. Each will do three week-ends of racing before it’s rebuilt." A surprising ammount of the 765 Moto2 engine is stock. It uses OE pistons, crankshaft, con rods, cams, main engine cases and air box, but the injectors are bigger. The rev limit has been raised from 12,650rpm to 14,000rpm for more power and to allow over-rev between corners. The real Moto2 bikes will have a Marelli ECU with traction and launch control and an autoblipper for downchanges. 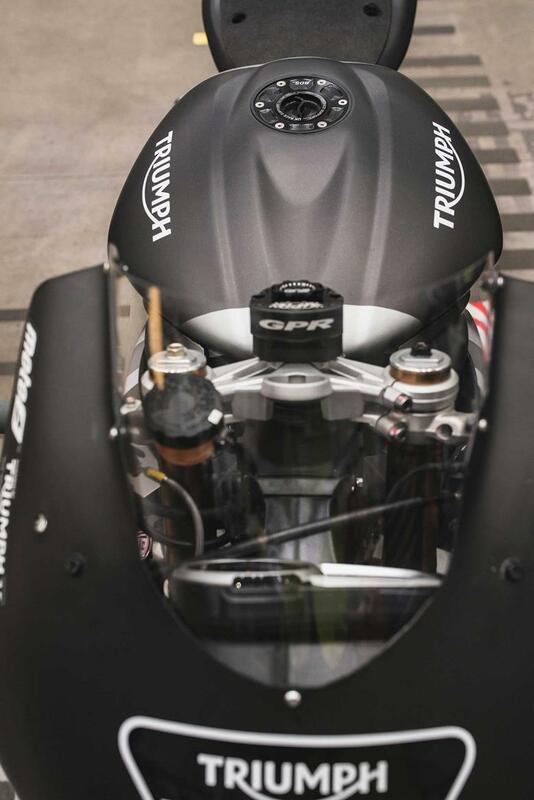 To celebrate the completion of their Moto2 engine project and their imminent return to GP racing, Triumph ran a series of special events around Silverstone GP weekend including a parade lap by their 765 Moto2 bike. 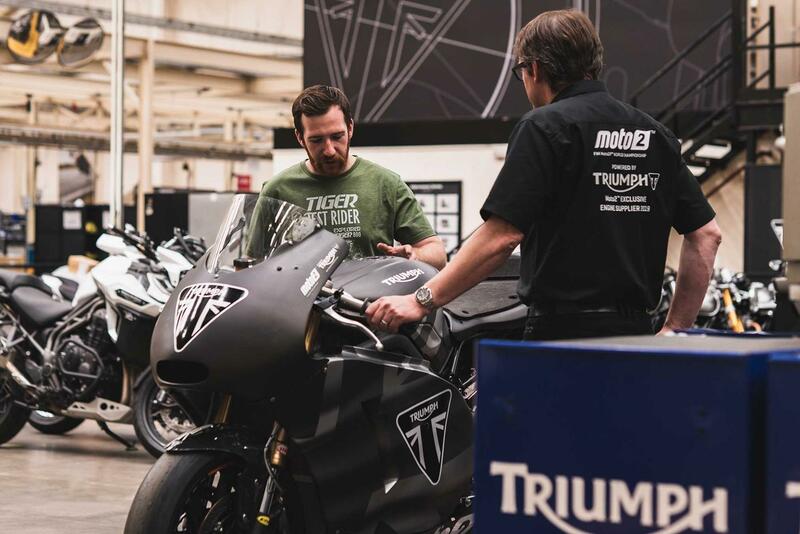 A host of Moto2 riders including Luca Marini, Sam Lowes, Danny Kent plus Moto3 rider John McPhee, attended Triumph’s Hinckley factory for the official unveiling of the engine, alongside members of the media. The riders also witnessed the final Moto2 engine being run on the dyno. The next time they get so close to the machine will be when they begin testing later in 2018. Arguably the pinnacle of Triumph's Silverstone activities was when double WSB champion James Toseland took to the track on the Moto2 prototype. It was the first time he’s donned his leathers in seven years. The bike, painted in a special Union Jack colour scheme, housed the final revision of the 765cc triple motor that will be raced in Moto2 next year. It was a very special occasion, despite the wet weather making it a challenging ride! The new engine has been warmly received in testing, with the increased power and more advanced Magneti Marelli ECU said to make the bikes feel much closer to MotoGP spec.